Sterling Publishing (NY), 9781454923053, 288pp. 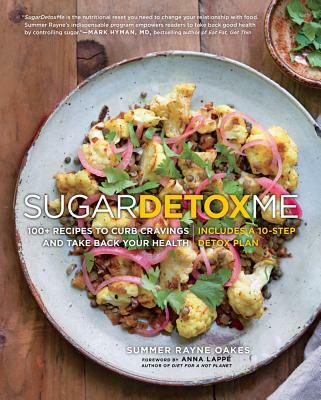 Overcome your sugar cravings, lose weight, and get your health back on track With more than 100 mouthwatering recipes, menus, and gorgeous color photographs, SugarDetox.Me is on a mission to help readers shake their addiction to the sweet stuff. It not only arms you with scientific knowledge about the harmful effects of sugar, it offers an achievable strategy for detoxing safely and effectively--including 10 Meal Maps. These maps explain how to create multiple meals, maximize each ingredient, minimize waste, and save money. There's no economizing when it comes to flavor, though-- each recipe delivers healthy, delicious food. Enjoy a breakfast of an egg, sunny side up, over cauliflower and bacon with potato hash; a light lunch of mixed salad greens with chili and sage-roasted acorn squash; and a memorable dinner of savory seared scallops over marinated mushrooms, corn mash, and red sorrel. And, to satisfy your sweet tooth without sugar, there's even a chilled bowl of banana-almond butter "ice cream. Summer Rayne Oakes, an award-winning entrepreneur and model, launched her website, sugardetox.me, in 2014. The site's seven-day guided sugar detox program, which was released as a trial in October 2015 and January 2016, has quickly become one of the leading websites to help people reduce or eliminate their sugar cravings. Most recently Oakes helped launch two venture-backed Good Food companies, including Foodstand and Good Eggs. In addition to her involvement in the Good Food movement (which supports fresh, locally grown food), Oakes co-founded Source4Style (now Le Souk), an award-winning marketplace that connects thousands of designers in 80 countries to sustainable material suppliers in 38 countries. Oakes was a correspondent on Discovery Networks and has been featured on CNN and Fox News, and in The New York Times, the Guardian, Vogue, Vanity Fair, L'Officiel, GQ, Natural Health, INC, Forbes, and many others. Outside magazine called her a "Top Environmental Activist," Amica listed her as one of the "Top 20 Trendsetters under 40, " CNBC named her one of their "10 Best Green Entrepreneurs," and The Guardian proclaimed her "An Innovator." Oakes writes regularly for MindBodyGreen, Savoteur, Refinery29, and the Huffington Post, and is a highly sought-after speaker. She lives in Brooklyn, NY.